A Remote Control Car That Can Fly And It's Also Bullet Proof! 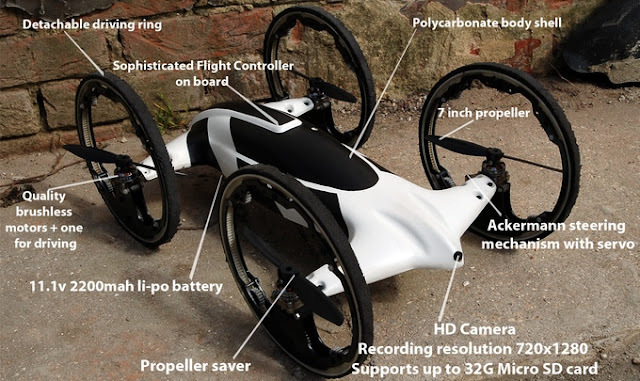 Who would have thought of a remote control car and drone all in one, right? There is actually such an ingenious gadget that will be launching to market called "B". This RC car is essentially a remote controlled hybrid car-helicopter capable of driving across all-terrain as well as taking-off and fly. The ingenious person behind this great concept has cleverly (and appropriately) named it "'B' the flying car". What I love about this hybrid car-helicopter/drone concept is that is able to transition on the move between driving, flying and back again. This hybrid RC car/drone can navigate through difficult terrain and fly, and achieve great speeds on flat surfaces too with its huge large wheels which measure 210 mm in diameter. You can also record all the action with the camera that comes on-board the car. See VertiGo Robotic Car That Climbs Walls Like A Gecko! B also boasts some seriously sturdy (but lightweight) body design thanks to the "bullet proof window" material used for the main chassis of the car, which allows the car to withstand the worst of landings. When the vehicle crashes from high altitudes, the driving rings detach from the housing and can be easily put back together. The future plans for "B the flying car" is to cover it in solar panels to allow it to charge from the sun and to also use the freely rotating propellers against the wind to generate extra power when stationary. To be honest, I can see this technology being applied to search and rescue as well as for military applications. I wonder how soon car manufactures will be prototyping a real flying car, which can also be operated by land and sea?